A special place in the world artistic culture occupy the work of Rembrandt Harmens van Rijn. In one of the periods of his career, the artist turns to writing biblical scenes. 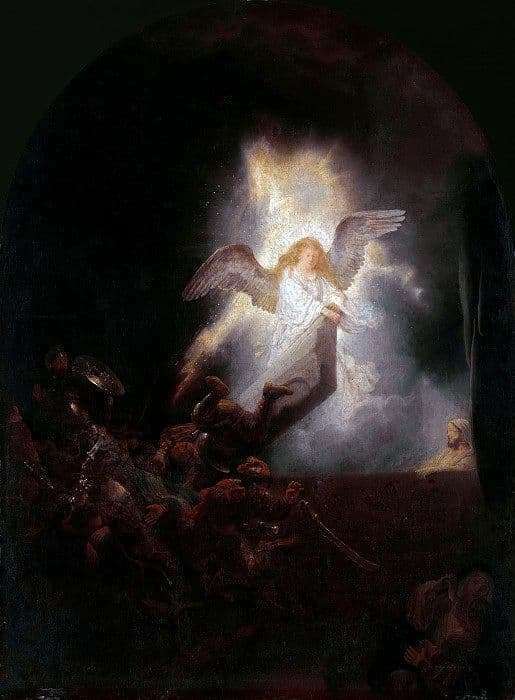 These works include the painting “The Resurrection of Christ”, which was written by Rembrandt in the period from 1636-1639. This canvas presents one of the most mysterious scenes – the resurrection of Jesus. This is a myth or a legend, but every artist has agreed to convey this event in his own, special language. Rembrandt, while creating this work, seeks to convey to the viewer not just a specific moment, he opens the curtain of this story. People are depicted on the dark side of the canvas: on the left side are Herod’s soldiers, in the corner of the right are two women. Why such unexpected witnesses at the resurrection of Jesus himself? The artist depicted the moment when the soldiers were trying to hinder the awakening of the Messiah, thereby transmitting a piece of prehistory in which the authorities of Jerusalem fought with the help of Christ with the help of military force. Proof of this is a soldier who tries to wipe at one of the women, and she, clasping her hands in the begging gesture for mercy, sat on her knees. The face of the great Messiah illuminates the light of an angel sent by God to give the people faith. The angel opens the coffin lid, and we see the elusive image of a living person who breathes, but has passed the gates of death. Only Rembrandt managed to convey Jesus is not as ideal as they used to see him before, he was really exhausted and dead and this can be seen on the face and arm, which he laid on the edge of the coffin, apparently in order to lean and stand.